Dancing in the Rain: Yes, I Will Have a Holiday Weekend Brain Dump, Thanks! Yes, I Will Have a Holiday Weekend Brain Dump, Thanks! It is the much anticipated Memorial Day Weekend here in the States! It is so well liked because it is considered the "summer kick-off". 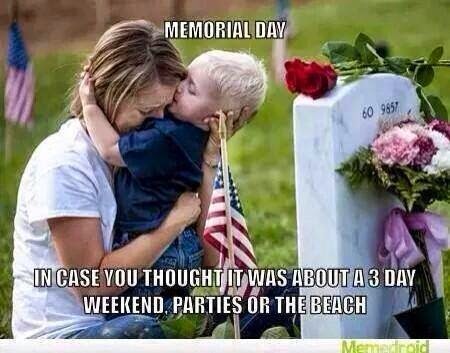 I don't want to rain on any one's parade (although it will probably rain on mine, literally), but class, do we remember what Memorial Day is really about? Yes, I did just say "dead soldiers". The title of this post says "brain dump" and it's on my mind, so there ya go. When I'm out with my husband I've noticed that whenever he sees a veteran or active duty military, he stops, shakes their hand and says, "Thank you for your service." He did so just yesterday in the Safeway check-out line. Mark is so proud of them. He wishes he could have been in the military. So I'm just here to say, I'm thankful for those who lost their lives, and you should be too. Now go enjoy your burger and beer! I am also grateful for what feels like a long overdue WIN for Mark. He had an angiogram of the iliac artery in his lower abdomen. It had gunk in it that was blocking blood flow to his left leg. His vascular surgeon was able to open it up and place a stent to help keep it open. Almost immediately Mark's leg felt better. So thankful to be able to breathe a sigh of relief because something actually went well! 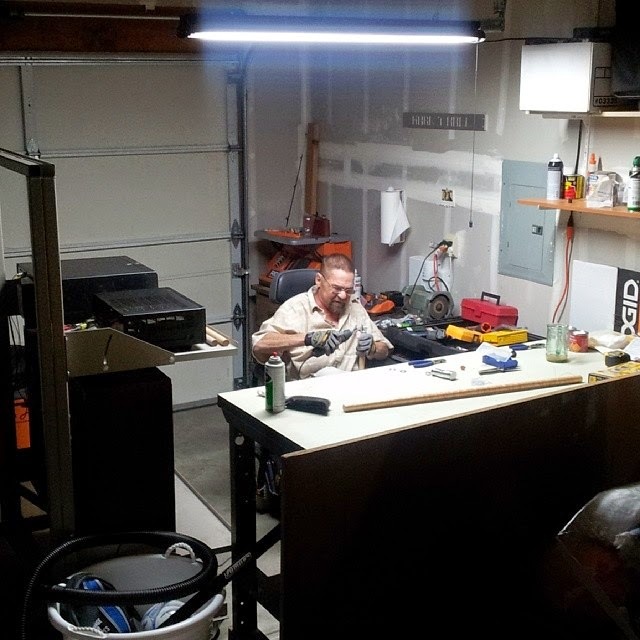 HE is grateful to finally have a man cave, complete with music, where he can build (make?) cool canes. He made one for himself, people have seen it and asked him to make them one. He's all excited about it. You know how my friend JHo and I turned 40 this year? Well she claims that she magically gained 10 pounds right after her birthday, and proceeded to warn me of this as mine approached. As you know, I have been trying really hard to LOSE weight so I vehemently denied that it would happen to me. So far so good. I can, thankfully, say that I have not put any weight back on since turning 40. Yay me! However, what 40 did bring me was a MONTH LONG illness. I'm assuming this is because Mark and I had to go and discuss how more sick he gets vs. how less sick I get. I jinxed myself. I've been doing battle with the crud since the 2nd. After eating my weight in two different chicken soup recipes, drinking OJ and adding fresh garlic to anything appropriate for THREE weeks, my immune system freaked out, making me take a turn for the worse, complete with a fever. It's like it said, "Sorry Jen, we've done all we can do, you're gonna need to call for back-up." So I finally went to the doctor who, thankfully, could see how miserable I was -- and how angry my throat and sinuses were -- and mercifully hooked me up with antibiotics. Today, I am grateful to be able to say that I can breathe through my nose relatively well. We had a very informative meeting with Camryn's school psychologist yesterday regarding her ADHD and struggles with school. Although we didn't get to him until she's nearly to high school, at least we know now we have someone to call on for help. Ooh! I found my favorite Merona t-shirts at Target at 40% off! 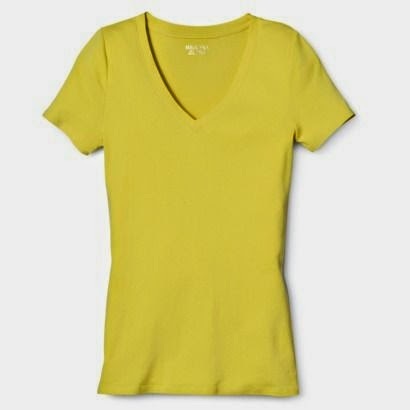 Grabbed a bright yellow one for summer! You know how once in awhile interacting online can point out something to you that you maybe kinda sorta knew but hadn't stopped to really put enough thought into to express, but then that one little exchange will make you take pause and go, "Huh."? I had one of those this week that I think will help me finish a post I've had in drafts for a couple of months now. I mean, at the very least. Mightcould also change something a little....? We'll see. Let's see....anything else I wanna get out? I may have gotten way too interested in the cover story in a magazine at the check-out line about Selena Gomez maybe being pregnant with Justin Bieber's kid. To the point that I Googled it when I got home, only to find rumors from 2012 and a recent Instagram shot of her in a bikini. Why was I so intrigued? I DON'T KNOW! But don't judge me. You know you wonder about stuff like that too. Linking up with Lizzi's Ten Things of Thankful.